Michael McFadyen's Scuba Diving - Fish Rock Western Drift On the Mid-North Coast of NSW the small town of South West Rocks is about 35 kilometres from Kempsey. South West Rocks is a very popular location for people to retire to live the rest of their lives as well as being popular for tourists. The attractions of the town are fishing, beaches and the nearby Trial Bay Gaol in Arakoon State Recreation Area and the adjacent Hat Head National Park. For divers, the South West Rock area is famous throughout the diving world for Fish Rock and its cave. The cave extends right through the small island and is an excellent dive in its own right. For details on Fish Rock Cave see my articles on the Shallow Entrance and the Deep Entrance. In addition, The Pinnacle at the northern end of Fish Rock is a magnificent dive which is matched by few dives in NSW or even Australia and can also be done as part of a couple of drift dives, Colorado Pass and The Land of the Giants. On the southern side there are the Shark Gutters which are home most of the year to grey nurse sharks and also have very good strands of black coral trees. 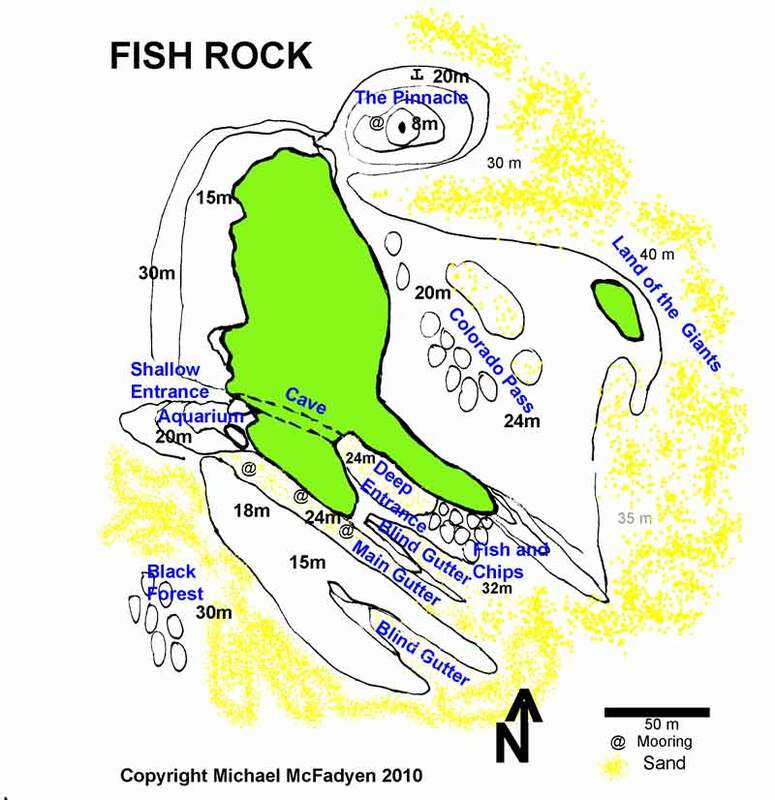 Another dive at Fish Rock involves the western side of the island, with small incursions onto The Pinnacle and into Fish Rock cave. The Pinnacle is a twin peaked mountain that rises from 30 to 35 metres right up to 6 metres just off the north-east corner of the island. When moored here, drop to the bottom and quickly explore the shallower sections of The Pinnacle before starting off to the south. Keeping the pinnacle and island on your left, swim to the south at a depth of about 25 to 30 metres. On the way you will see green and loggerhead turtles resting among the small boulders. After about 15 minutes if you are swimming slow and exploring a fair bit, you will encounter a gutter that runs from the sea floor back at 45°. If you follow this, it will be rocky at first and then a shell bottom that starts at 16 metres or so goes up to a "dune" and then gradually rises till at 10 metres it is again a rocky bottom. The walls of the "gutter" are quite shear, especially in the shallower section. This is, in fact, the shallow entrance to Fish Rock Cave. You will have enough time to go a short distance into the cave before returning to The Pinnacle. When you exit from the cave, return by sticking to the 10 to 15 metre level. Along the way, look for more turtles as well as the anemones that can be seen on the gentler slopes of the island. Above you there will be prolific fishlife, including schools of eastern rock blackfish, surgeonfish, yellowtail and silver sweep. The rocks will also be home to a few firefish, many species of leatherjackets, long-finned bannerfish, butterflyfish, wrasses, very inquisitive blue gropers and flutemouths. As you go, keep a good look out for grey nurse sharks, especially in the entrance to the cave. There will also be schools of kingfish, bonito and silver trevally up above you. On the rocks there will be numerous wobbegongs ranging from juveniles to huge 2.5 metre specimens. The visibility on this dive is usually very good, in the order of 20 metres and even reaches 30 metres regularly. An excellent dive, combining the best of The Pinnacle and Fish Rock Cave.